Hillsboro’s Abby Brown attempts to spike the ball as two Miami Trace defenders leap up to attempt a block on Thursday at Hillsboro High School where the Lady Indians battled the Lady Panthers in FAC action. HILLSBORO – The Lady Indians hosted the Lady Panthers of Miami Trace on Thursday at Hillsboro High School in Frontier Athletic Conference volleyball action and lost in straight sets 25-23, 25-12 and 25-19. The first set was a back and forth affair as the two teams were unable to pull ahead by more than three points throughout. Miami Trace took their first lead of the set when Taylor Dawson stepped behind the line to serve and led the Lady Panthers to six consecutive service points and an 11-9 lead. Hillsboro fought back to tie the set at 15 points apiece during the service game of Abby Brown and took the lead a short time later when Katie Condo’s serve led to two straight points and a 17-16 Lady Indians lead. The Lady Panthers clawed their way back into the lead and forced Hillsboro head coach Nicole Dickey to call a timeout with the scoreboard reading 22-20 in favor of Miami Trace. Following the timeout the Lady Panthers recorded another point before Hillsboro was able to break their serve. The Lady Indians were able to tally 23 points in the match but it was not enough as Shalyn Landrum sent the ball over the net for the final time in the set and gave Miami Trace the 25-23 win in set one. “The first game was pretty close all the way through. Fortunately for us we put together a couple of good serves right there at the end of that first game and were able to get that win”, said Lady Panthers Head Coach Doug Mace. The second set was all Miami Trace as they cruised to a 25-12 win and at one point recorded 12 straight points to crack the game wide open for the Lady Panthers. In the third set the Lady Panthers jumped out to an 8-0 lead as they served first and the Lady Indians were unable to find an answer early. Miami Trace continued to play well and led by a score of 20-11 when Hillsboro called their second timeout of the set. After the timeout Abby Brown got the opportunity to do some damage with her service game and she led Hillsboro to five straight points as they climbed within four points at 20-16. 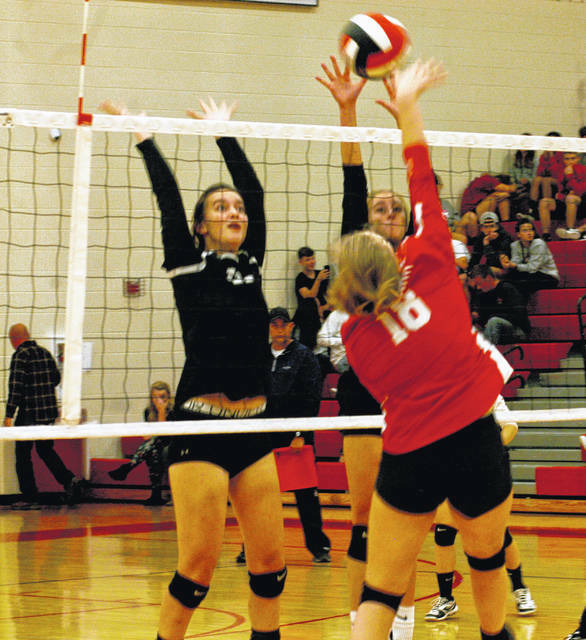 But, the Lady Indians were unable to pull off the comeback in the set as they lost 25-19 in the third set. The Lady Indians were led by Sydney Bobbit in kills and digs, Hope Middleton who had five solo blocks and Jordan Williamson had 14 serve attempts with six aces. Hillsboro Head Coach Nicole Dickey talked to The Times-Gazette after the match and thinks the girls have the talent to win but need to put it all together at the same time. “Tonight we struggled with serve receive. The girls are playing hard we’re just unable to pull it all together and push through. We tend to take a bit of a roller coaster ride each set. As their coach I need to be able to help them maintain a positive attitude and keep their heads up because the ability is there,” said Dickey. Hillsboro and Miami Trace will both be back in action on Tuesday, October 2. The Lady Indians will travel to Chillicothe to take on the Lady Cavaliers and the Lady Panthers will travel to Jackson to take on the Ironladies. Both are FAC matchups.